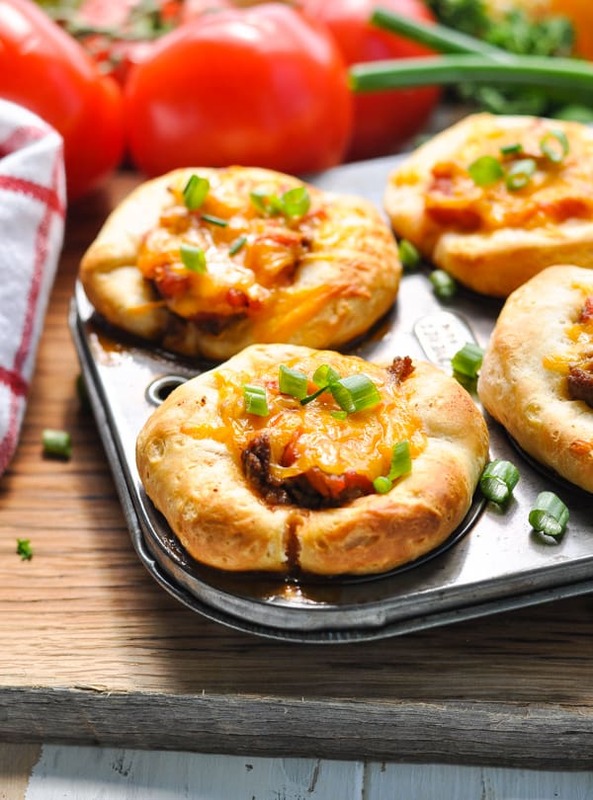 These kid-friendly, freezer-friendly, prep-ahead 5-Ingredient Taco Biscuit Cups will please everyone at your dinner table! For those crazy nights when you need a quick meal right now, you can't beat the convenience of a simple and delicious taco dinner! 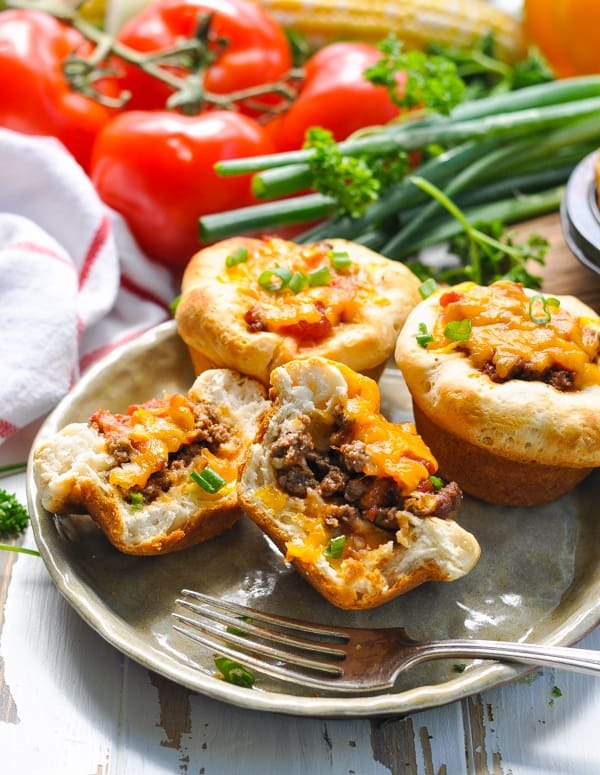 These kid-friendly, freezer-friendly, prep-ahead 5-Ingredient Taco Biscuit Cups will please everyone at your dinner table! For those crazy nights when you need a quick meal right now, you can’t beat the convenience of a simple and delicious hand-held supper! This recipe was originally posted in June, 2014. The photos were updated in August, 2018. I have yet to meet a child that doesn’t love a basic taco, and this particular recipe just made Mom’s life easier…thanks to the mess-free little package that they bake inside! Muffin tins to the rescue! Children (and adults) also love any excuse to eat with their hands. 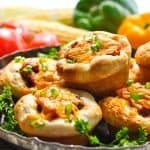 Taco Biscuit Cups are just the ticket for your picky eater, for your next buffet party, or for a freezer meal that you want to microwave in seconds and eat on the run (no utensils required)! What are the 5 ingredients necessary for this taco recipe? 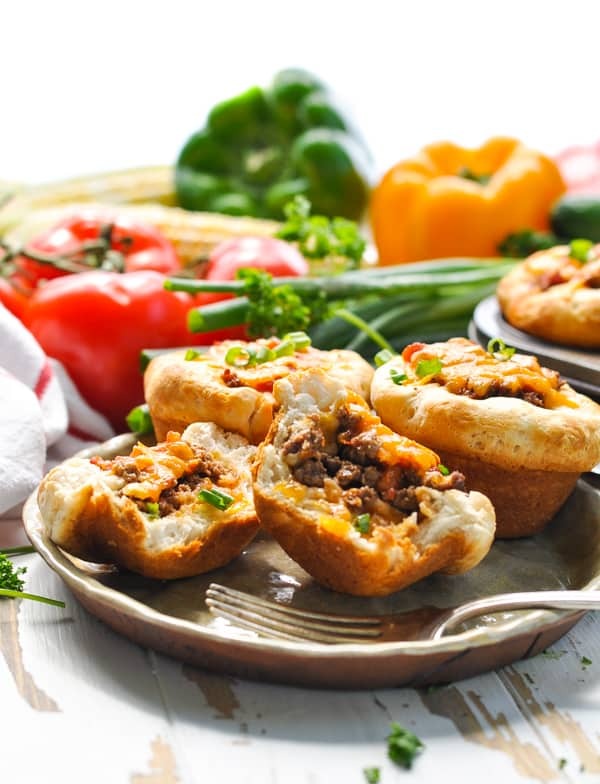 Which toppings should I serve with my taco cups? I often save the meat that is left-over from taco night so that I can use it for another meal. These cups are a great way to take advantage of the beef that has already been cooked, cutting my prep time in half. Plus, it’s nice to put a different spin on the flavors so that your family doesn’t get bored. Prep ahead! 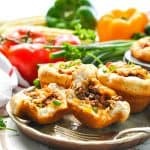 You can cook the meat in advance and keep it in your freezer or in your refrigerator in an airtight container until you’re ready to assemble the cups. Prep ahead! You can even assemble the entire tray of in advance. Just cover loosely with plastic wrap and put the muffin tin in your refrigerator for a few hours until you’re ready to bake. Perfect for nap time! Freeze your leftovers! You can make a double-batch, or just freeze any extras that you might have on hand. The cups reheat in the oven (covered loosely with foil) or in the microwave. Have fun, and enjoy a stress-free dinner with your family! Spray 8 cups of a standard-size muffin tin with non-stick cooking spray. Set aside. Cook ground meat in a large skillet until no longer pink. Drain; return meat to skillet, and season with taco seasoning according to package instructions. Flatten biscuits with your fingers (or roll out) so that they become larger and thinner (about 4.5 inches in diameter). Press into bottom and up sides of prepared muffin cups. 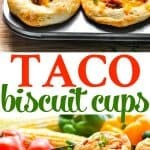 Spoon a few tablespoons of taco meat into the bottom of each biscuit cup, packing it down and adding more if it will fit. Top meat mixture with a tablespoon or two of salsa and about 1-2 tablespoons of shredded cheese. Gently press down the cheese so that it is centered over the filling and is not spilling over the edges of the pan. 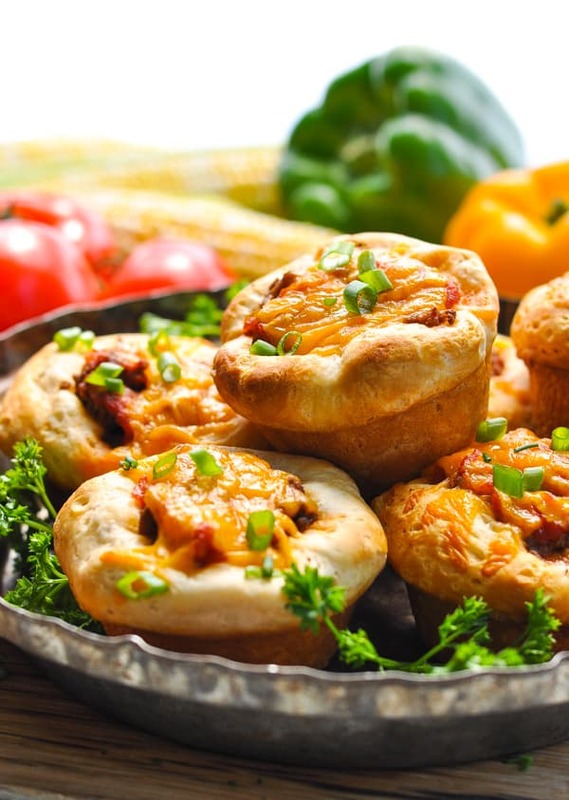 Bake for 15-18 minutes, or until cheese is melted and edges of biscuits are golden brown. Remove muffin pan to a wire rack and gently run a knife around the edge of each biscuit to loosen. Use a spoon to carefully remove biscuit cups from pan. 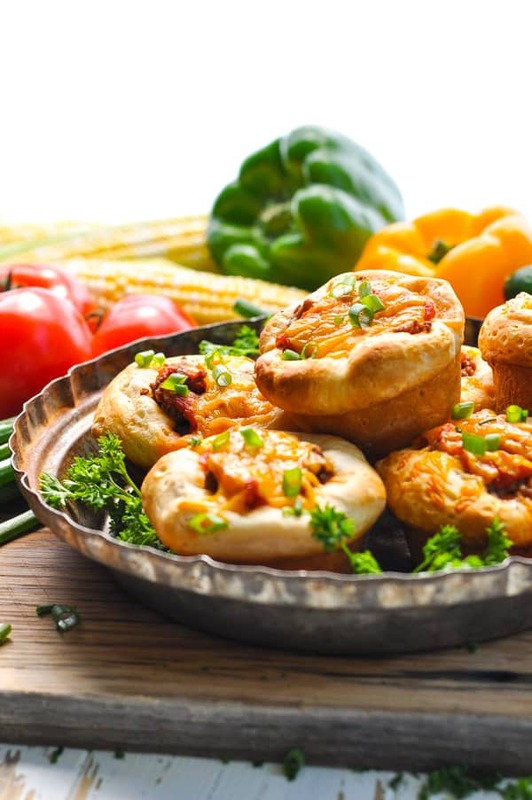 Serve hot and garnish with optional toppings. Cooking Just for Two? 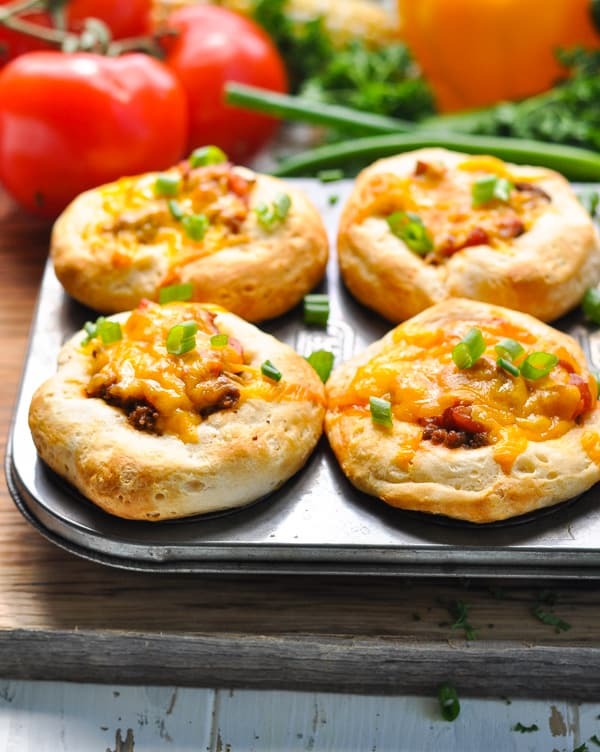 Freeze the extra Taco Biscuit Cups for a later meal!